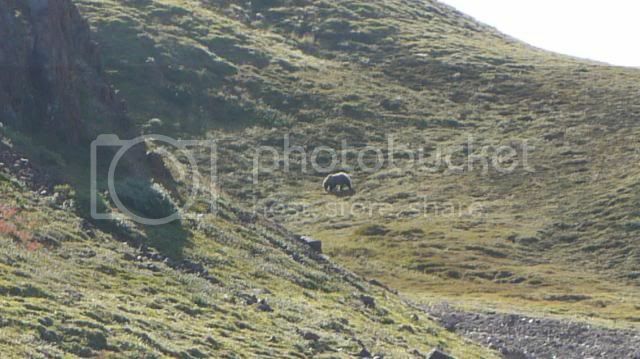 The closer shots are of a Mom Grizzly who had 2 yearling cubs with her. They got within 10 yards of us. We didn't get too many good pics as we were too busy ****ting ourselves. The long shot is of a large male who charged us. We reported him to the rangers. 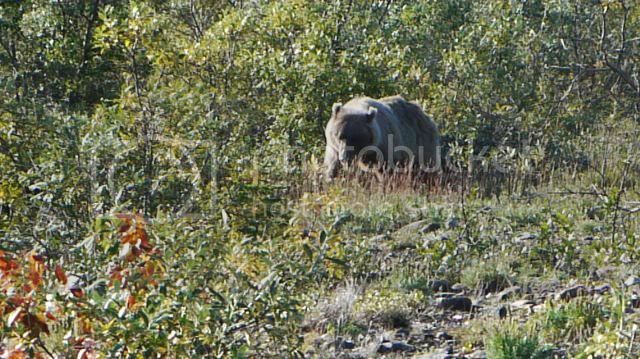 10 days later, a guy from San Diego was eaten by a grizz within a half mile of this encounter. Our bear was very aggressive and I believe he was the culprit. He was shot from a helicopter while guarding his kill. I don't know what to think. We want to travel into their land and they are punished for defending it. Where are the pics from ? Here is the story of the guy who was killed. When I saw the news clip video, I immediately recognized the sand bar on the Toklat River and the mountain in the background in the exact same photo that I had snapped earlier from standing in the same spot. I searched through my photos, and sure enough, there it was. Though we did not see a bear right there, we saw one less than a mile away, as well as several others in the valley. We took the Denali bus tour after finishing the Y1K. Twelve hours and 95 miles in school bus seats, but well worth the day for the dozens of animals - bears, moose, sheep, foxes, and landscape we would never otherwise have seen. The long shot is of a large male who charged us. You are lucky on both counts. According to Dr Stephen Herrerro a mother grizz with cubs is the most dangerous, followed by younger males who don't know the rules yet. Most charges, though, result in the bear veering away at the last minute. Un-nerving, to say the least. Regarding the guy who was attacked and partially eaten, he must not have read the brochure they hand out nor listened to the briefing. 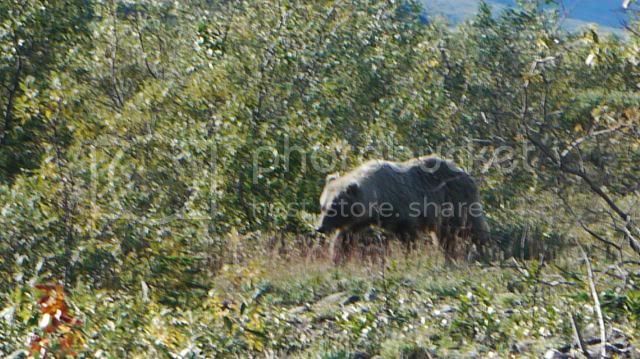 Had he not approached that bear within its discomfort zone both bear and human would be alive today. I agree. My buddy and I have backpacked in grizzly country several times and know the rules by heart. We have had a few encounters and did exactly what we were supposed to do. When in grizzly country, we talk constantly and bang out trekking poles together after every few yards. It becomes automatic. However, I understand how this poor guy was mesmerized by a giant predator in front of him and could not help but take tons of pics while forgetting the danger. It happens. I remember getting on my hands and knees to photograph alligators in Hilton Head from three feet away. I didn't realize the danger until I got the photos developed. I was entranced. I once was wading in three feet of water, while desperately trying to drop a clouser minnow in front of a 10' shark. I was so awestruck by him and the prospect of catching him that I forgot the danger.